To get you started, here’s one highly anticipated PS4 game you can pre-order now, plus three new releases you can grab digitally if you missed them! Are you ready for the next level of authenticity in couch-centric basketball experiences? NBA 2K16 is upping the game for this popular franchise, bringing your favorite sport to life with heightened realism and strategy. Head to PlayStation store on September 25 to pre-order your future obsession four days before its release. The world of Destiny is about to get a LOT bigger, thanks to this meaty expansion. Get prepped for an all-new story campaign, quests, foes, and loot galore as you battle the dark forces of Oryx and his massive Dreadnaught. The post apocalyptic desert wasteland is a lot more fun when you’re packing heat and tooling around in a sweet ride. High-speed vehicular manslaughter and crazed lunatic battle chases are all but assured! Open world missions and put a fresh spin on this long-running series. As Big Boss, you have to build an army to take down. Expect a lot of weird story twists and stealth fun along the way. Also, Kiefer Sutherland voice acting? Win! 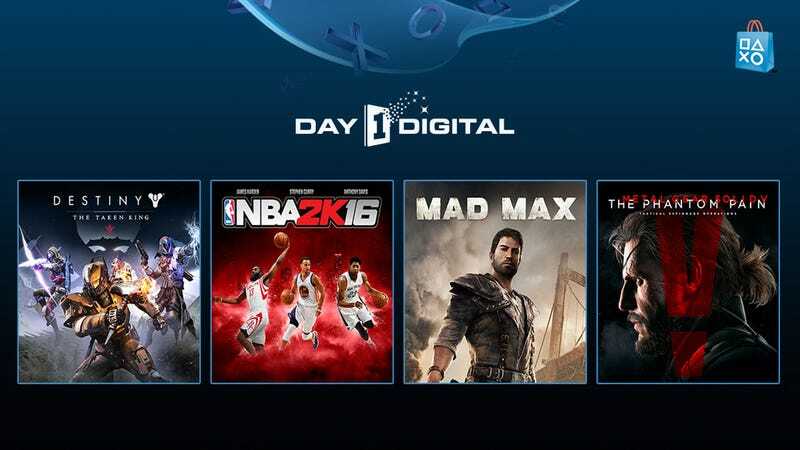 Those are just a few of the many awesome upcoming releases that will hit PS4 over the coming months. Check out PlayStation Store now to pre-order your must-play picks for the holiday season and pre-load those games so you’re ready to play the moment they go live.